On Aug. 25, New Horizons crossed the orbit of Neptune—the last planetary orbit crossing during cruise. Now we’re outbound for the frontier! On Aug. 29 we put New Horizons into hibernation for the final time. This last hibernation lasts 99 days and ends on Dec. 6. It’s a little hard for some of us on the mission team to believe that after seven-plus years of hibernating through most of the 2.5-billion mile journey from Jupiter to Pluto and the inner reaches of the Kuiper Belt, the final, short leg of cruise is actually upon us. We will wake New Horizons for the last time in just 10 weeks! When we do that, encounter preparations will begin, and six weeks later, the Pluto encounter itself will begin. Wow. We are here. We’ve reached other end of the planetary system. Twenty-five years after first wondering if Pluto might someday be explored, we are about to do just that! This summer’s eighth and final “pre-Pluto” spacecraft and payload Active Check Out (ACO-8) lasted from June through late August, and it was both busy and successful. All spacecraft subsystems—both prime and backup—were checked out. Additionally, we performed our first course-correction since 2010, uploaded the final autonomy system software for the encounter, checked out all seven payload instruments, conducted some final instrument calibrations, and performed our first optical navigation campaign to home in on Pluto using New Horizons’ Long Range Reconnaissance Imager (LORRI). Those activities went well, and so did many others that we conducted, including more sampling of the heliospheric plasma and dust environment with our PEPSSI, SWAP and Student Dust Counter instruments. The only real anomaly of the entire ACO was a failed startup of a single Alice ultraviolet spectrometer observation. That observation was to study the distribution of interplanetary hydrogen near Neptune’s orbit; it failed because Alice was colder than it ever had been, and onboard software “safed” (or turned off) Alice’s high-voltage power supply when it took too long to get to its set point voltages. In retrospect, this was a blessing in disguise, because it alerted us to loosen up some timing settings for future power-ons when Alice will be as cold or colder as we approach Pluto. Had we not found this out in the ACO, we likely would have discovered it after some missed Pluto observations on approach! 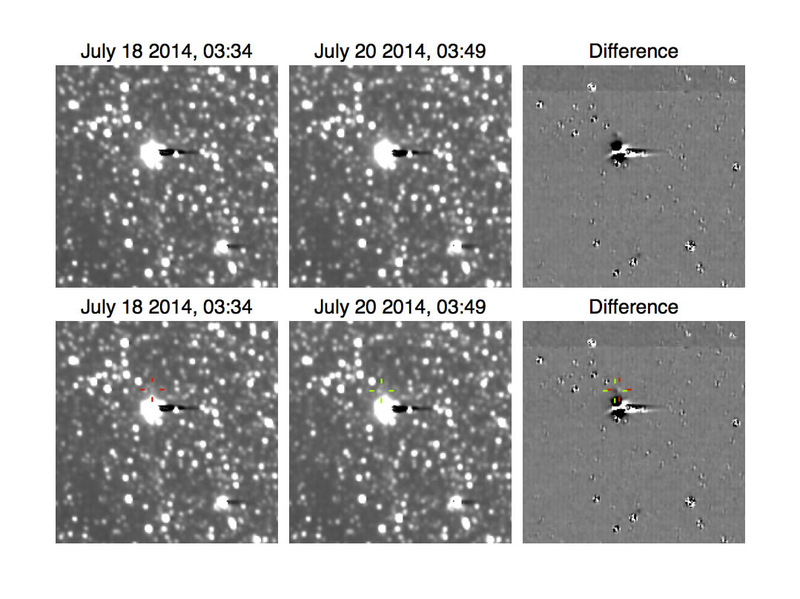 A happy surprise we got from ACO-8 was the subject of a recent news note from New Horizons: A test of the methods we’ll use to search for hazards in the Pluto system on approach detected Pluto’s little moon Hydra. We didn’t think it would be possible to see Hydra until early in 2015, when we are about twice as close as we were in July, but science team members John Spencer and Hal Weaver found Hydra in the July hazard-sequence test! The early detection of Hydra is good news about our ability to detect currently unknown moons and rings. And in other news, we crossed the orbit of Neptune on Aug. 25. That day just happened to be the 25th anniversary of Voyager 2’s historic close approach to Neptune in 1989—what a cosmic coincidence! To celebrate that and our last planet-orbit crossing before reaching Pluto, NASA held a press conference at its headquarters in in Washington, D.C. Featured speakers were Jim Green, NASA’s director of planetary exploration; Ed Stone, Voyager project scientist; and myself. 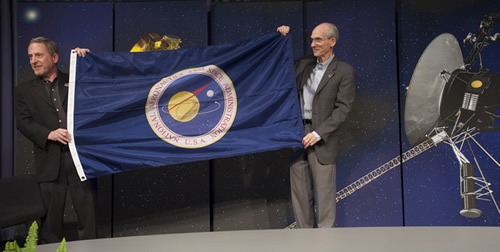 After the NASA Headquarters press conference, Dr. Stone presented me, on behalf of the New Horizons project, with a NASA flag that had been flown in Voyager mission control. That flag will now fly in New Horizons mission control, representing Voyager’s passing of the outer solar system exploration baton to New Horizons. It doesn’t get any more real than that, that we’re almost ready to explore new worlds on the frontier of our solar system! You can watch the press conference, as well as a fascinating panel discussion that followed it, here. In other mission news, our search for a Kuiper Belt Object to fly by and explore (if NASA approves an extended mission for New Horizons after Pluto) moved into higher gear this summer with a 200-orbit Hubble Space Telescope search. The Hubble search produced spectacular images that contain a bevy of potential targets in the Kuiper Belt that we are now tracking to refine their orbits and to determine our ability to reach them within our fuel supply. Also, we just completed a week of detailed engineering reviews of every aspects of the past year’s flight, as well as more planning for approach science. And next month, the first encounter approach sequences that serve as the spacecraft flight plan will be built. Each of these sequences runs two weeks. It takes about eight weeks to create, test, review, and certify each one of these to be ready, so we’re beginning in October. By the time December comes, four loads will be in various stages of development at once. And by the spring, seven loads will be in development at once! We’ve planned for this, and staffed up for it, but now the rubber is meeting the road—we’re actually creating and testing the beginning portions of the Pluto encounter! Finally, before I close this update, I have one more piece of news. On Sept. 11 we reviewed our latest tracking data on New Horizons and determined that the burn this summer was accurate enough that there is no need for any new trajectory correction before at least March, possibly later. So we cancelled the burn opportunity we’d planned for January—it’s simply not necessary. This is a good omen for our hoped-for Kuiper Belt flyby because each burn we can cancel saves a little fuel and makes the Kuiper Belt mission more feasible. With that, I’ll say thanks for following our journey to explore a new planet and its moons. But I also want to say one more thing: Please tell your friends and coworkers, your neighbors, and your family about New Horizons and the coming exploration of the Pluto system next year! Nothing quite like it has happened in decades, and we want everyone to know, because we’re planning a wide variety of ways to bring everyone along on the adventure with us. Until I write again later this year, I hope you’ll keep exploring—just as we do!